Excellent hostel facilities are available on the campus for boys. The hostel with homely environment, well furnished and well ventilated rooms, is located in eco-friendly, pollution free scenic setting on a flat stretch of land vanshing into ascendant chain of of pine-covered hills with a gurgling and foaming brook in the front. 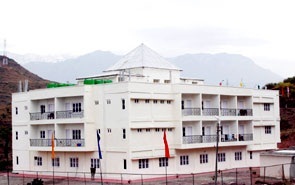 Facilities, like computer room with internet connectivity, 24 hrs power supply, indoor games,common room, canteen service, water cooler with purifier etc are the other features of the hostel. The hostel mess is clean and economical. It is run by a committee of boarders with fixed term in rotational basis. Each hostel provides mess facility and services of room attendents to its boarders in addition to recreational and other basic facilities. The allotment is made by a committee approved for the purpose according to certain prescribed norms. Meritorious students and those belonging to far-flung areas of the state are given preferance.